There is a common misconception surrounding the concept of "reduced juice" sports betting, and it is typically the "square" or "newbie" bettors who fall victim to the idea that they are always getting the best line available when the line is -110. What they fail to realize is that sportsbooks offer up "reduced juice" lines as a way to entice a bettor to play at their spot. For those of you not familiar with what a "reduced line" is, it is a betting line that is typically associated with the point spread and ranges between -103 to -105 instead of the standard -110. If you were to apply this concept into your everyday life, playing at a sportsbook that offers "reduced juice" would be the same thing as spending an extra few minutes in your car and driving to a location that is offering up a gallon of gas for $2.49, compared to settling for the convenient gas station at the corner and getting the same product for $2.53. While it may not seem like a big deal to save an extra couple of cents at that exact moment, the long-term effect of getting the better/cheaper price (while buying gas or betting on sports) goes a long way in the effort to protect your bank account/bankroll. How Do Sportsbooks Survive by Offering Reduced Juice Lines? The difference between a "square" and "sharp" bettor is night and day, and sportsbooks tend to manipulate their promotional material to the newer bettor in hopes of drawing them in. When a "square" signs up for a sportsbook and is given the option between "reduced juice lines" or a "100 percent sign up bonus", the percentage of bettors who choose the "reduced juice" option is next to none. The idea of getting anywhere between $100-$500 in "free" money is almost too good to pass up, and that is where the sportsbooks win. Generally speaking, these "sign up bonuses" are subject to a five, 10 or even 20 times rollover in order for those funds to become withdrawable. The chances of a new bettor turning a $400 bankroll ($200 deposit + the $200 sign up bonus) into $1000 or $2000 is very unlikely to happen for a number of reasons. The first reason is that a new bettor likely isn't interested in the never-ending marathon that is sports betting. They likely want to hit a few big parlays to make themselves feel good and then cash out. As we all already know, parlays are a terrible bet to make. The second reason is the lines. Because the new sign up decided to take $200 in "free" cash, the lines they will be betting into are much worse than the lines a savvy bettor is betting into. The typical point spread line of -110 may seem like a great price to lay, but in order to sustain long-term profit, you will need to win a higher percentage of your bets compared to betting into a "reduced juice" line of -105. The moment a new bettor neglects the opportunity to bet "reduced juice" lines for the rest of their betting life is the exact moment the sportsbooks win. A sportsbook that offers up "reduced juice" lines typically have the sharpest lines on the market. If they didn't, they would lose money rather quickly. Most "sharp" bettors prey on weak lines and usually find a high success rate in doing so. A "square" wouldn't be as quick to catch on, thus giving sportsbooks a bigger edge when accepting "square" money. Now that we've established how sportsbooks survive despite offering up a "reduced juice" promotion, we can turn our attention to how bettors can better protect their bankroll and potentially turn a bigger profit over the long term. The absolutely biggest and most important benefit of receiving a "reduced juice" promotion is the effect it has on your winning percentage. When a bettor bets into the standard -110 line, they are risking $110 to win $100. Doing this on a consistent basis makes the "theoretical break-even point" 52.4 percent. This means that in order for a bettor to come out with even the smallest of profits, they will have to have a winning percentage of 52.4 percent. If you are betting into a "reduced juice" line of -105, you will not only be saving five dollars per bet, but the "theoretical break-even point"drops to 51.2 percent. While this 1.2 percent drop off may not seem like a huge deal, it is actually massive when you look at the larger body or work - hundreds or even thousands of bets. By looking at the chart listed here, you will get a better understanding of just how much you will typically save by betting into -105 instead of -110 over 35 bets. As you will see, the first handful of bets see relatively little savings, but as the number of bets increase so does the savings. If you bet into a -110 line 35 times, you would have risked a total of $3,850, compared to $3,675 for -105 lines. That is a savings of $175, which is almost two full bets while laying -105. That savings also gives you two more chances two pick a winner and increase your bankroll. If you are interested in finding out expanded numbers, I have done some calculations, and this is what the numbers say. We already know that if you bet -110 lines you must pick winners at a 52.4 percent clip in order to just break even. If you are even slightly off, and that win percentage drops to 50 percent, you will be down a good chunk of money. For example, if you bet $1,000 per game and hit 50 percent winners, with the juice you would wind up with -$55,000, which means you are out a total of $5,000 while betting -110 lines. If you are lucky enough to have a "reduced juice" sportsbook, betting the same amount of money and hitting at the same win percentage (50 percent), your losing bets would be a total of $52,500, which means you would be saving $2,500 in juice alone. I don't think I can paint a clearer picture for you as to why "reduced juice" lines of -105 are so vital to a handicapper's long-term success. 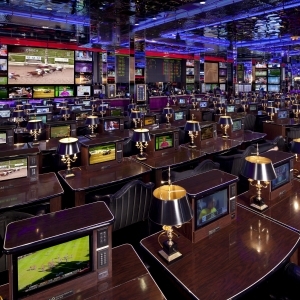 As I briefly touched on earlier, most sportsbooks offer new bettors sign up bonuses in order to get them to play at their location. The truth of the matter is that these sign up bonuses are generally a smoke and mirrors ploy to hide the fact that they offer subpar odds to bettors. Our friends over at 5Dimes have quickly become the model sportsbook in terms of promotions and what they offer new bettors. Prior to completing your sign up, you will be prompted with eight (yes, eight) different bonuses that you can choose from. Seven of them are flashy deposit bonuses, but it is the last one - the "reduced juice" bonus -- that is going to make or break your venture into the sports betting industry. Unfortunately, most amateur bettors will opt for the flash deposit bonus. Sure, they get their bonus funds instantly and can claim to have a bigger bankroll than they can afford, but I can all but guarantee they will lose every single dollar while betting into standard, subpar lines. A smart bettor who is serious about his handicapping would jump at the opportunity to choose the "reduced juice" bonus. Not only does this bonus apply for the rest of your betting life, it will almost certainly pay dividends down the road when your betting career is up and running.